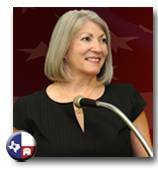 Barbara Carrasco is running for the 16th Congressional District of Texas. Barbara is a twenty-one year resident of El Paso and a small business owner. It is because of her many years’ experience in business and her involvement in local politics that Barbara wants to be your advocate in Washington, D.C. It is a deep love for family that motivates Barbara to become involved in El Paso politics and to really make a difference. She was born and raised in New Mexico and is the 3rd of 11 children. She has been married for forty-one years and has raised two children and has one grandchild. Barbara has become increasingly concerned about the world her children and grandchildren will someday inherit. Barbara believes if we don’t act now, in the near future our children and our children’s children will inherit a different America, an America full of angst, and debt--and one without an opportunity of an American Dream! Barbara is running because she wants Washington to be more accountable to the citizens of this country. It’s unbelievable that in a free society such as ours, elected officials will consider bills that they have not even read and pass major policies that have not been vetted. Barbara believes we must work on the important issues for Congressional District 16, promoting policies for El Paso, and not politics from Washington, D.C. She will fight for an aggressive plan for job creation, solutions to our challenges along the border and advocate for the implementation of a lean, accountable federal government that works for the people. Barbara firmly believes that the American people are losing faith in our government and it’s time to reclaim the American Dream and restore the greatness of our country for our families and our communities. She also believes we should be doing a better job of protecting the United States of America. Barbara is concerned about the high rate of unemployment inside Congressional District 16, which is much greater than the state and national averages. As a business owner, she understands how certain policies in Washington are affecting job growth. Overreaching regulation by the EPA, restrictions passed in Dodd-Frank, along with new mandates from the Health Care Act and an uncertain future regarding business taxes have created the perfect storm for employers. Because of her years in business, Barbara knows what it will take to set priorities and implement policies that will get El Pasoans working again. While El Paso was recently given this distinction of “Safest City in the U.S”, which is an honor, Barbara insists that we must not rest when it comes to the security of our borders. Barbara believes that immigration is a total failure of the federal government to provide one of its basic responsibilities, to secure our nation’s borders. She will be a strong and energetic advocate for real solutions for controlling the borders. She’ll push for solutions that maximize current resources available, such as the federal partners already in El Paso and she will advocate for those solutions in Washington. Graduated with honors from New Mexico State University with a Bachelor of Business Administration in Finance.